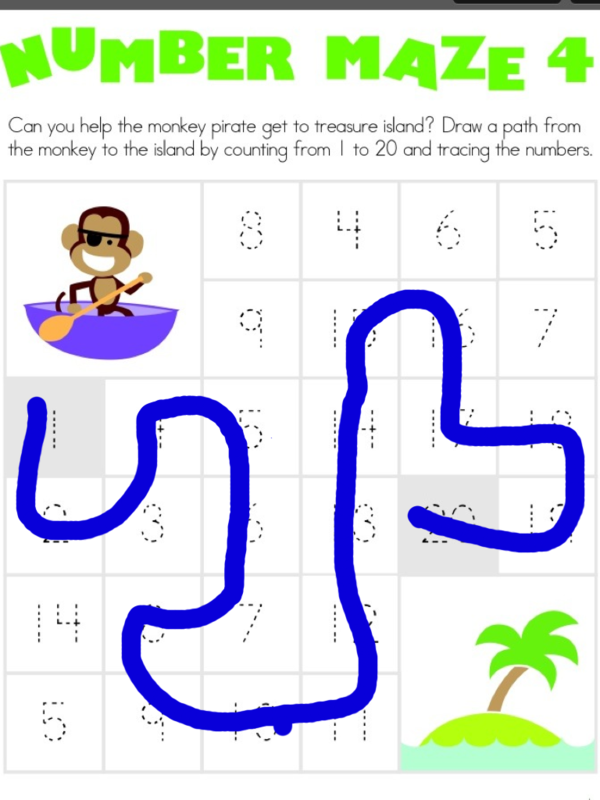 Are you using paper pencil tasks with students such as worksheets for eye hand coordination tasks such as mazes, dot to dot, tracing in the lines, word searches, handwriting, letter formation, drawing and coloring activities? Would you like the option to have a student perform these drawing tasks on your iPad? Most offer free worksheet as well as may have memberships or subscriptions for educational materials but most worksheets are typically are in a PDF format that you can save on your computer or print out for use with the student. You’ve probably found your favorite sources already! To make a drawing task or worksheet available for your students on your iPad I use Doodle Buddy for iPad due to ease and familiarity of use. So how do you do that? First you need to get the electronic files on your iPad. Save the worksheet to your computer then send it via email to an account your can access on your iPad. When the email is received the document is embedded in the email. Tap on the picture of the document (now an image) and “Save Image” or “Copy” choices are presented on the iPad screen. Choose “Save Image” which puts the image automatically to the Photos library. If the picture has extra text from the email use the Edit button (top of screen) to crop the picture using the crop tool that appears at the bottom right of the screen. 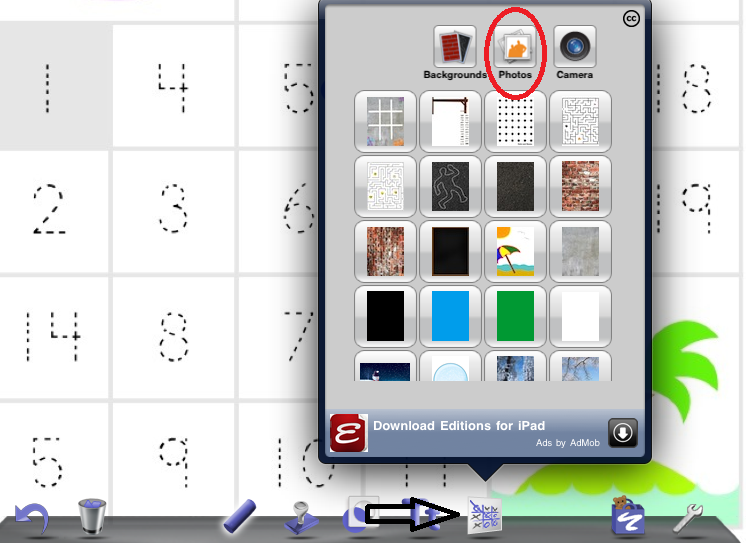 To import your picture of the worksheet into Doodle Buddy first click on the small icon that looks like tic tac toe at the bottom right of Doodle Buddy screen (arrow in image below). 7. You will then get a background, photo and camera buttons (circled in red). Click on the Photos icon which takes you to your Photo library. 8. Once in your Photo library, find the image of the worksheet you want to use, tap it to import it into Doodle Buddy. The “worksheet” image is now available to be used with the drawing tools. The chalk at the bottom center has drawing tools including a brush, chalk, glitter, smudge or eraser. Here is a finished product of a worksheet completed in Doodle Buddy. 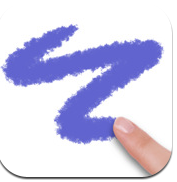 Color and size of your line are other options available to you with the drawing tools. If you have an iPad2 with a camera you can take a picture of worksheets or pages and import them into Doodle Buddy to draw or mark on. Take a picture with the camera, centering the worksheet and getting the best picture possible. Lighting is important as is the background the worksheet is on. A photo of the worksheet will not be as clear an electronic document but it is doable. With your picture in your Photo library you can then follow Option A steps 5-8 to bring the pictures into Doodle Buddy for use. Saving to your Photo Album can be a method of collecting assessment data on your student work. You may not want to save everything they produce but occasional products or repeated products for pre-post data collection can be another method of formative assessment. You may want to organizing your photos in albums or using a photo album app asPhoder or My Photos to help you name, organize and retrieve their work on your iPad for IEP reviews, or to reflect on their progress for quarterly reports. (Don’t forget to back up your iPad if you are collecting student artifacts!!!). There are other ways to import worksheets using online resources such as Dropbox or when syncing your device. Photos can also be transferred using or Bluetooth with apps such as Bump which can transfer photos between iDevices with Bluetooth services turned on. I think the above methods are the easiest. So many possibilities!! Now you have one more way to use your mobile tool box for student interventions or for documentation purposes. Once you start using the iPad in other ways, the possibilities seem to be endless, although it may take a specific app for that! Ideas or suggestions? Please share! This entry was posted in Activity Worksheets on Your iPad, Apps for OT's, Fine Motor Development, iPad, iPod, Special education, Visual Motor and tagged Activity Worksheets on Your iPad, apps for fine motor, Fine motor apps, iPad, occupational therapy, special needs students, Visual motor apps. Bookmark the permalink. To mark up PDF’s on the iPad I like to use free pdf-notes. It is easy to email yourself the pdf’s and then open them up in pdf-notes where you can draw right on the visual motor worksheets. Here is a link to an article I wrote with more information http://yourtherapysource.com/ipadapp.html. I will have to try out Doodle Buddy for picture images though. thanks for the idea. Thank you for entering the comment again on the blog. You have great resources- thanks for sharing them! Thanks for sharing this! I will definitely be trying this. It’s about time I get organized and put all of my favorite worksheets in one place. This will allow me to use them over and over, without printing and making photocopies all of the time. Thanks again! Thank you Karen for your expertise. There are so many note takers out there! I have been using Notability but I still need a bit more practice with all that it does. I will check out the Paperport, especially with the audio sync to each page. Do you know where you can transfer Paperport to? Does it transfer to Google Docs or to Dropbox if you want to save it or print it? Then again you can always take a screen shot of it as evidence of how a student is doing. Have you updated to iOS 5? If you want to archive, save some of the students work, you can take a screen shot on your device. It saves it in your photos, you can then create an album of a single students work to use for IEP review, parents, comparing as pre post, etc and keep it in a named album per student with iOS 5.0. Our paras have been doing some other cool things with the album feature. Thanks for sharing the great info! Thank you Carol. I am a pediatric OT practicing in the school system and private practice. What a tremendously helpful site. So much relevant information in one site. I am just getting started with the ipad and love it. I will stay tuned and send you my thoughts as I have time to tool around with some of these amazing apps. I am honored that you visited! Question- Are you required at school to do any educational billing? Or are you doing any daily notes or data collection on your iPad? I use AweSome Note HD which allows me to write notes, take pictures, schedule and create a to do list for myself all in one spot! I can also send the information to Google Docs for archiving. Just something to consider. I will post about it sometime soon. Have you tried emailing his productions then printing them out? Could you take a screen shot (press power button and home button at same time) and then email from photos? Another good option to print, thanks Margaret! Diane, In Doodle Buddy the tool (looks like a wrench) allows you to save to photo album or send in email. If you save to your photo album you have an option to print!